What is BC BPSD Algorithm? 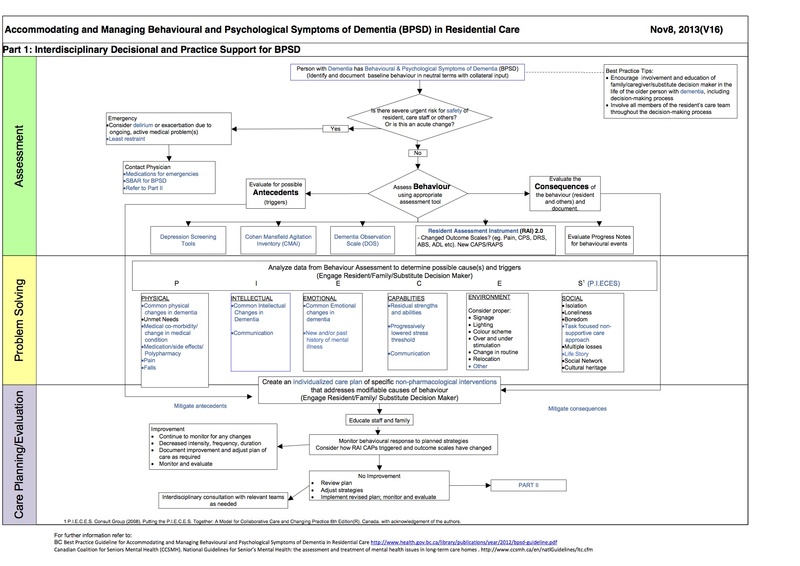 The BC BPSD Algorithm is a practical, electronic, interactive tool intended to support interdisciplinary, evidence-based, person-centred care for persons with behavioural and psychological symptoms of dementia (BPSD). It is very simple to use and completely mobile friendly - meaning that you can use it on your smartphone, tablet or laptop. The algorithm is intended to be combined with the Best Practice Guideline for Accommodating and Managing Behavioural and Psychological Symptoms of Dementia in Residential Care, released in 2012. The BPSD (Behavioural and Psychological Symptoms of Dementia) Consensus Algorithm project is a provincial collaborative effort, that originated and was led by Interior Health, and included representation from all BC Health Authority partners (Fraser Health, Island Health, Northern Health, Vancouver Coastal Health), the BC Ministry of Health, general and specialist physician partners, community pharmacists, and the BC Patient Safety & Quality Council. Behaviours are not just symptoms of a neurobiological disease. It is a complex response to the interaction of many variables that include the person's current cognitive abilities, psychosocial and cultural history, physiological and emotional needs, and physical and social environments. Today, behaviours in dementia are being recognized as a form of communication, rather than random, unpredictable or meaningless events that arise from disease. It is helpful to view behaviours as the person's best attempt to respond to their current situation. Who should use the BC BPSD Algorithm? 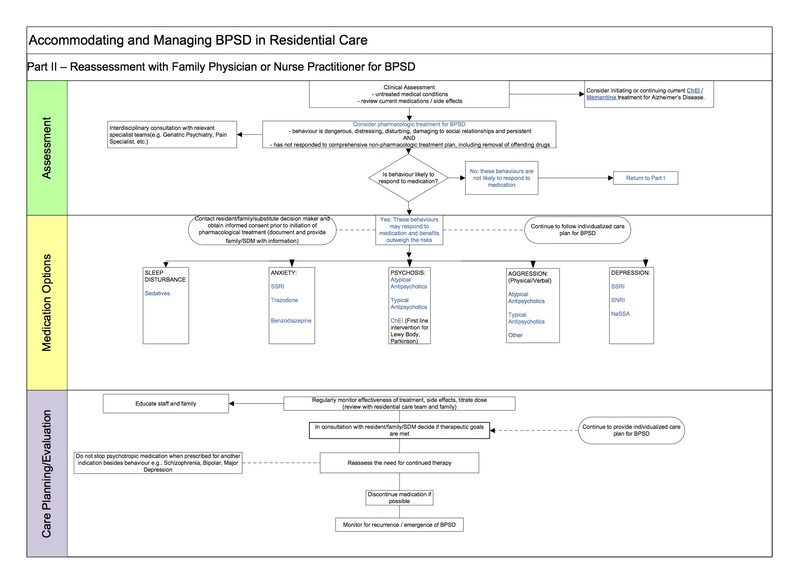 The BC BPSD tool has a specific focus on non-pharmacological interventions and the appropriate use of antipsychotic drugs in the residential care setting. Care staff, family physicians clinical experts, and Health Authorities in all of British Columbia's health care settings are encouraged to review the guideline and algorithm, as they offer evidence-based tips and tools to deliver best practice, non-pharmacological approaches to person-centred dementia care. The BC BPSD Algorithm is divided into two parts. Back button - To navigate between pages in the tool, you can use your web browser back button, or the navigation menu in upper left hand corner. Feedback form - if you notice a technical error on any page, please use the "leave feedback" form to report it. Evaluate BPSD Tool button - is located on every page at the bottom of the screen; please take the time to provide your feedback. This will help us evaluate the BC BPSD Algorithm as a clinical practice tool. The information sheets are available in both pdf and jpeg formats because not all web browsers can read a pdf file. Some tools may be downloaded and printed for use for individual-specific care plans. The tools are available as BC health authority specific formats, or in a non-branded format for use by other organizations. Many of these forms are in a pdf format, and if you have a pdf writer, you may be able to type directly onto the forms and save the file.